Gmail: You’re doing it wrong. Just kidding, you’re probably doing it just fine, but what if you could do Gmail better? What if you could scan huge amounts of unread email quickly, know that important messages won’t get buried, and have time-sensitive things reappear right when you need them? You can. 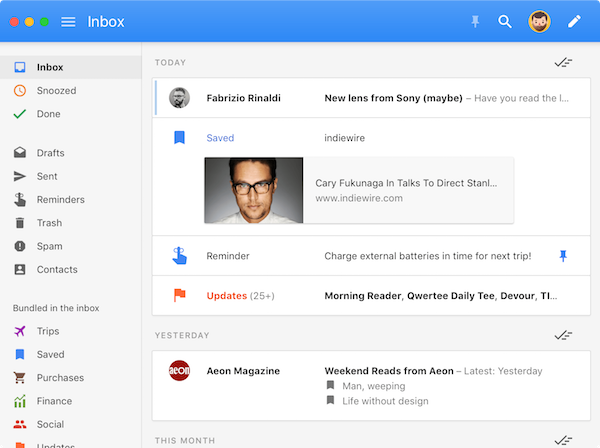 Inbox by Gmail is Google’s vision of email as your to-do list. Your incoming mail is presorted into bundles that are quicker to go through than a jumbled inbox of everything, and you triage each message based on whether it requires action or not—you can even snooze email to save for later. 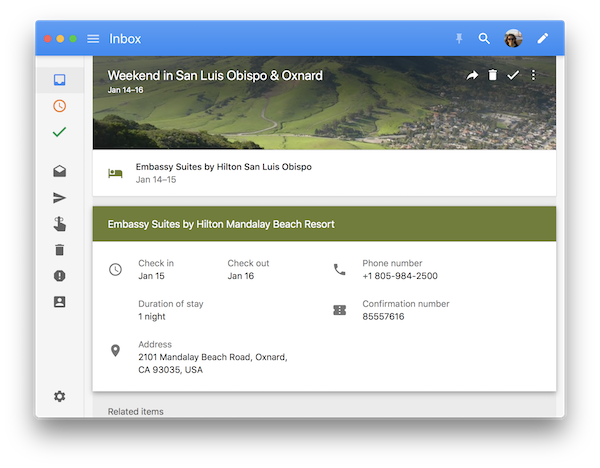 Inbox has a web version, but as with Gmail, Google didn’t make a native app for macOS. 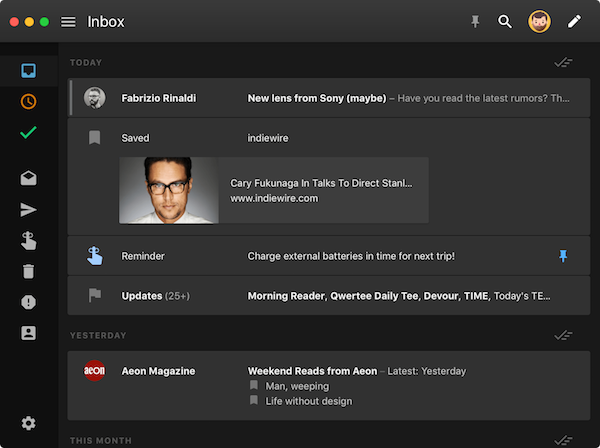 Luckily, Boxy is a full-featured, beautifully designed Inbox client for the Mac, and it’s free now. Here’s why we think you’ll love it. 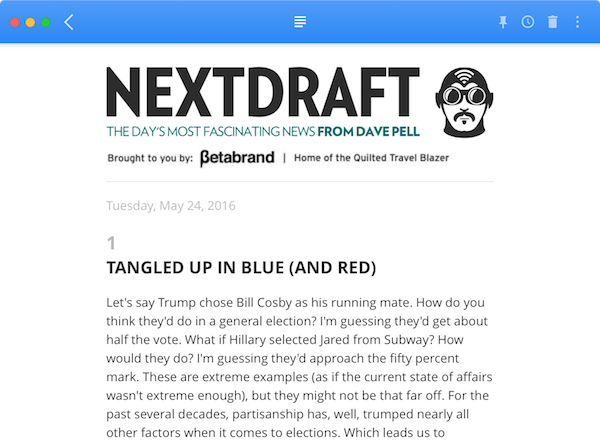 If you haven’t tried the Inbox style of Gmail, don’t worry about jumping right into Boxy. The app is great at training you how to use it, from the introductory tour to the pop-up help. 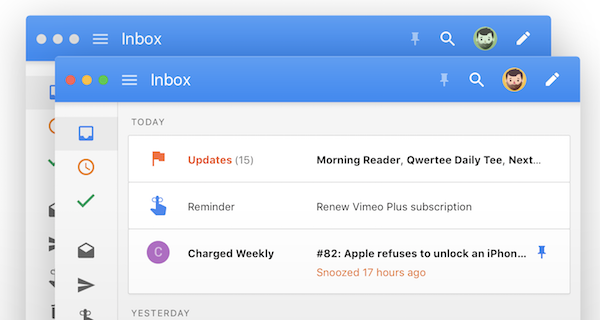 Inbox by Gmail turns your email into a big to-do list, which is how a lot of people use theirs already. In this scheme, you mark an email as Done to archive it. (This works the same as archiving an email in Gmail, and you can also delete emails in Boxy.) When you archive things you don’t need to act on, the emails in your inbox become your de facto to-do list. Pins: Put a pin in an email if it’s something you need to act on. Pinned email stays in the inbox, and can be reached anytime by clicking the Pin button in the toolbar. 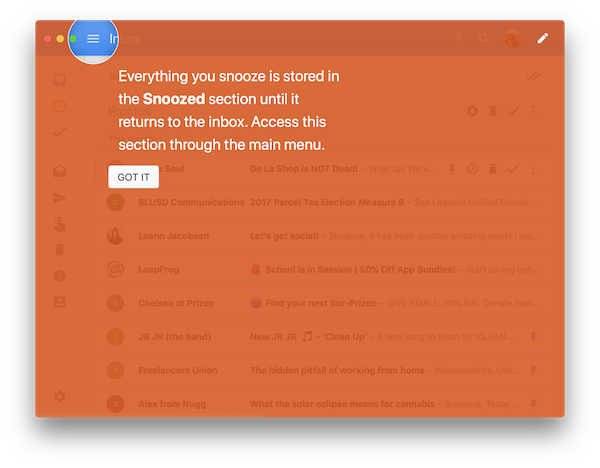 Snooze: If there’s an email you want to punt into the future, you can click the Snooze button, and then specify a date when the email should pop back into your inbox. For example, when you get the confirmation email after buying some concert tickets, you might snooze it until two weeks before the concert to remind yourself to find a babysitter and make a dinner reservation. 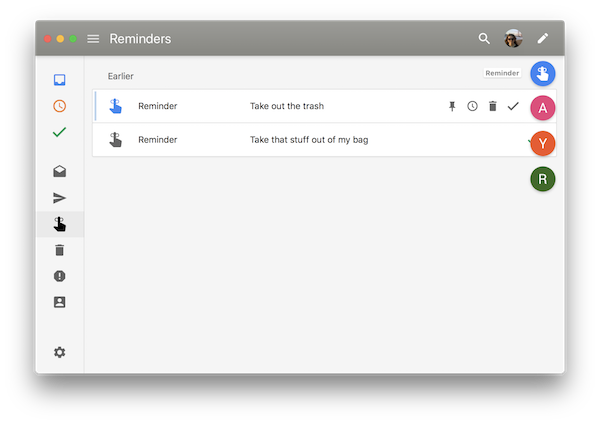 Reminders: Ever send yourself an email to remember something? Boxy has Reminders. Click the Compose button on the right side of the toolbar and select Reminder, then make a note to yourself. Just like emails, Reminders can be snoozed to appear on a certain date (Remember to get cash for the babysitter! ), or pinned, or and marked as done. Done: Click the checkmark on an email or reminder to mark it as done, which archives it. What’s more powerful is marking an entire bundle as done—which archives everything except the messages you have pinned. Part of the beauty of Inbox by Gmail is how it bundles up related mail, and Boxy does this feature very well. You can have it bundle up your trips, finances, purchases, updates, and more. Grouping these related messages together makes them easy to scan. A bundle shows up together in the inbox, and you can click one to expand it. Then just scan the message previews, click the pin next to any message you need to act on, and then click the check mark for the bundle to mark the rest as done. I wind up processing a lot of stuff—notifications, receipts—without even having to read the full message. The trips bundle is especially magical. It gathers confirmation emails for flights, car rentals, hotel reservations, and on, and having all this stuff in one place is beyond convenient. The banner for each trip even gathers at-a-glance info about your flights and hotel stays—click one to expand it and you’ll see check-in and check-out dates, the phone number, address, confirmation number, and so on. This can save you tons of time if you’re preparing an expense report, or you just need to call the hotel because you left something behind. Compact or full: Boxy has a compact look with just icons in the sidebar. Or you can click the hamburger button on the left side of the toolbar to see the full view, including every one of your labels. Change the theme: In the Interface tab of Boxy’s preferences, you can switch between the Light and Dark themes, and more monochromatic Black and White themes. Some people find Dark or Black to be easier on the eyes. Attachment previews: Boxy shows attachments in the preview of each message — it’s really easy to see if a message has attachments, and even better, Google Docs links count as attachments. But if you want to hide those previews, there’s a box in the Interface preferences. Email previews: I love the message previews, because sometimes you can tell enough from the two-line preview to know how to process the message, and you don’t have to open the email at all. But if you’d prefer just a list of the senders and subjects, click Hide Email Previews in the Interface preferences. Scrollbars: Some people hate having scrollbars disappear. The Interface preferences have a box you can check to keep scrollbars on all the time. Font size: The Interface preferences also hold a slider to adjust the font size across the application. This is especially great if you keep Boxy on a second (or third!) monitor that might be an extra few inches from your eyes. You can be logged into two Gmail accounts at a time in Chrome, but it’s a little clunky. Boxy makes it easy to monitor two or more Gmail accounts. In the Accounts menu, just click Add Account to sign into as many accounts as you like. Then you can switch between them in that menu, or using the key commands listed there. Even better, you can have a Boxy window open for multiple accounts simultaneously. Instead of simply clicking a second account in the Accounts menu, just hold Option while clicking (or add Option to the key command), and a second Boxy window will open with that account, letting you manage both accounts side by side. Boxy doesn’t have an option for a single, unified inbox, but with the way its bundles, pins, and snoozing works, it’s probably less confusing to keep each account in its own separate inbox. Boxy supports Markdown, an easy-to-learn syntax for formatting text and adding links. You can compose in Markdown and send the message all marked up. Boxy has a Reader mode for long messages like newsletters, so you can stretch out and read them outside the confines of the inbox. Just press Command-Shift-R or click the button that looks like the Reader Mode button in Safari. The interface melts away and you’re left with just the text. 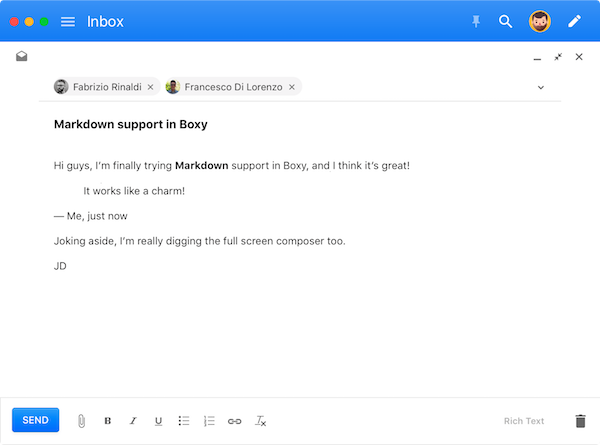 Boxy is the best of Inbox by Gmail in a native Mac client, and we’re thrilled to had it on Setapp family. Let us know what you think!